The Bannalp is a hidden gem of the Central Switzerland. It is situated in the Engelberg Valley, high above the villages Oberrickenbach and Wolfenschiessen. It can be reached by foot or by public transport – via two cable cars from Fell: Fell-Chrüzhütte and Fellboden-Bannalpsee. 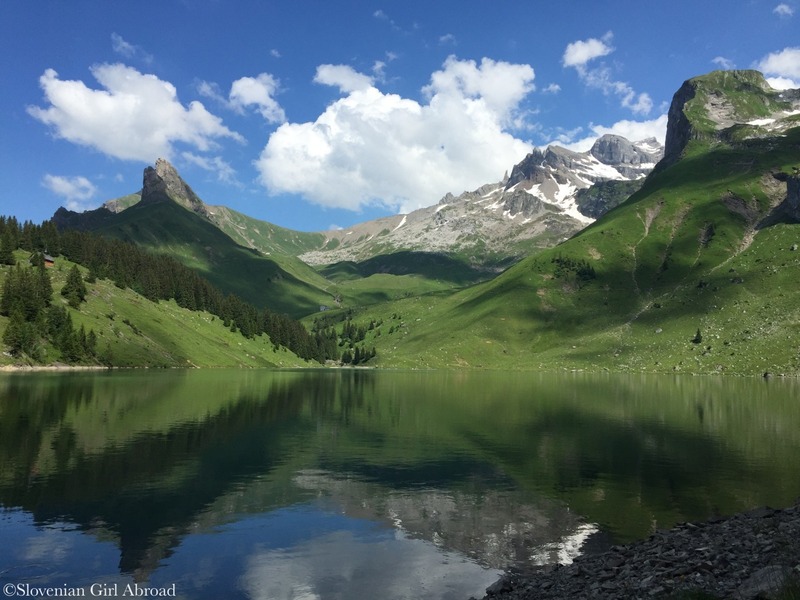 Because my husband and I were up for a challenge, we decided to hike from Oberrickenbach – Fell all the way up to Bannalpsee. Two hiking trails lead to from Obberickenbach to Bannalp. We’ve chosen the one via Haghütte. This 5 km long trail is well marked. It ascents from the altitude of 903 m to the altitude of 1713 m. With the total ascent of 810 m is quite steep and demanding. It definitely wasn’t the easiest hike I have ever done, but the beautiful landscape and the will to see what is waiting me at the top, kept me going. After a little less than three hours we’ve reached the Bannalp. Tired, but happy we’ve completed the hike and arrived to our destination, we’ve stopped by the Chrüzhütte mountain hut where we’ve refilled our batteries and had delicious lunch. Rested and with our bellies full, we walked to Bannalp’s main attraction – Lake Bannalp (Bannalpsee), an artificial lake at 1587 meters altitude. The lake covers an area of 16 hectares (40 acres) and is surrounded by the majestic mountains. It is truly breathtaking place well worth all the effort of hiking there. Even though we’ve reached the lake in the afternoon was the water still calm enough to reflect the surrounding mountains. We’ve rested by the lake for a while and as none of us fancy a walk back down to the valley, we decided to take the cable car. 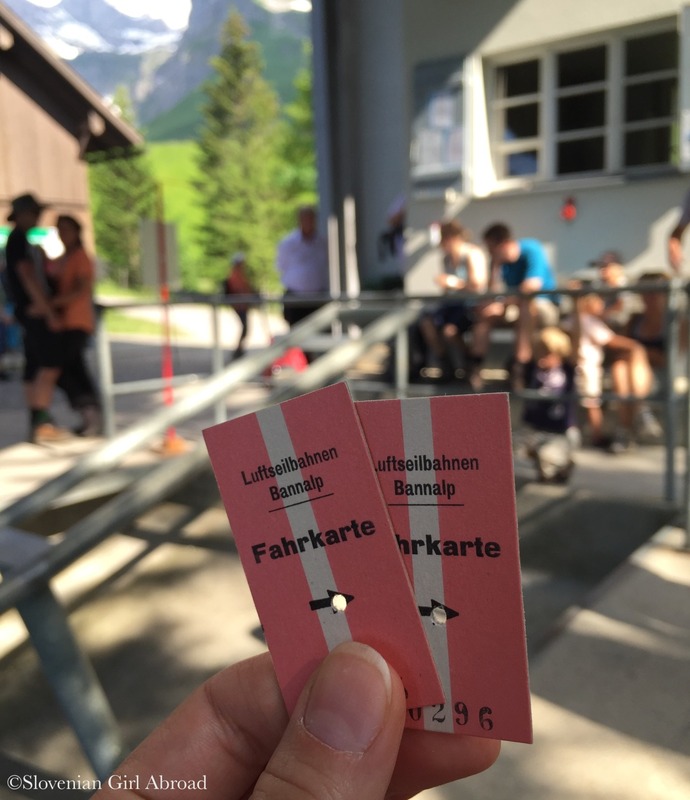 We’ve chosen the Fellboden-Bannalpsee cable car which was closer to the lake. We bought out tickets and waited to be called for our ride. Because it was quite busy day at Bannalp and the cable car can only fit up to 8 people, we had to wait for app. 40 minutes to get back to the valley. We’ve reached the valley exhausted but happy and grateful we’ve been able to experience another amazing hiking trip to amazing place. HOW TO GET TO Bannalp? By train & bus: Take the train from Lucerne to Wolfenschiessen, there change for bus in direction of Oberrickenbach – Fell. Follow the A2 motorway in the direction of Gotthard. Take the exit at Stans-Süd and drive in direction of Engleberg. When you reach the village Wolfenschiessen turn left in direction Oberrickenbach. When you reach Oberrickenbach you’ll find the free parking spaces by the cable car stations Fell and Fellboden. What a truly, truly stunning place! How I wish I could go there! Wow, it’s absolutely stunning! I still can’t quite believe I actually live in this gorgeous country. Thanks for the public transportation directions! 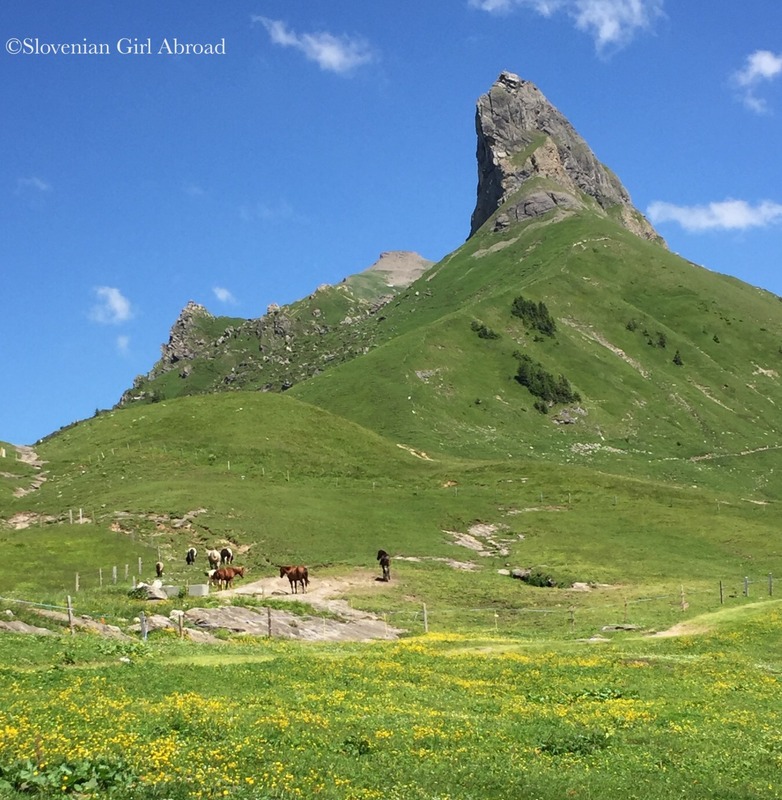 Now if only Switzerland wasn’t so expensive to visit…..
You’re welcome! 🙂 Yeah, sadly it’s definitely not destination for those on low budget. Such a gorgeous place ~ love the photo! Goodness, that is beautiful. Hard to believe there are places that perfect out there. The reflection in the water is stunning. Beautiful part of the world. Stunning photos. Oh my goodness truly beautiful. Two of my favorite places on the planet are Switzerland and Slovenia! Going to Switzerland was a childhood dream of mine since fourth grade; I’ve gotten to go three times and loved ever moment of my time there. I forget how many times I’ve been to Slovenia and I am equally in love with your homeland and well!!! another incredible fairytale like location! It’s a beautiful state! I was glad to live there for 3 years and get out of the city! Check out my post! WOW the scenery is gorgeous and your lunch looks delicious! Cheese, anything with cheese is good and now that we live in Japan and mainly travel around Asia I really miss good cheese!!! I am amazed by Switzerland landscapes. Those mountains and lakes are so beautiful. I hope I can return to the country one day an enjoy several days of hiking. Your photos of Banalp are beautiful! Particularly love the first two. Thanks for sharing your trip at #MondayEscapes. I love skipping the funiculars! I just started blogging about hiking in Ticino- love that you also give out public transport information. That would be awesome! Probably one day somewhen we all could meet halfway and hike some place together. This place looks too beautiful, especially those reflections! 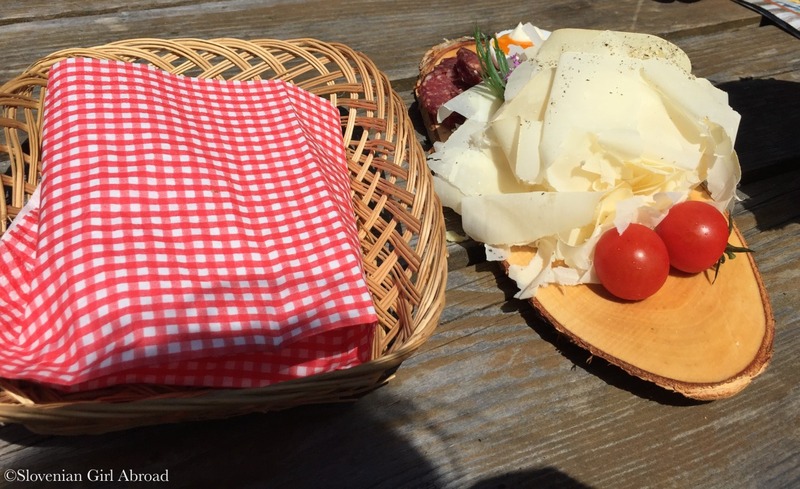 I would love to see more of Switzerland as the few days I have spent there, I loved! 🙂 It’s the perfect place to get some stunning nature! Oh my gosh, your photos look unreal! I mean I know that the Slovenian Alps are pretty but this is so stunning!! What amazing views! With a total ascent over 800m it must have been pretty tough going but, like you say, what a reward you got at the top. Thanks for joining us on #adventurecalling calling I hope you can again tomorrow. 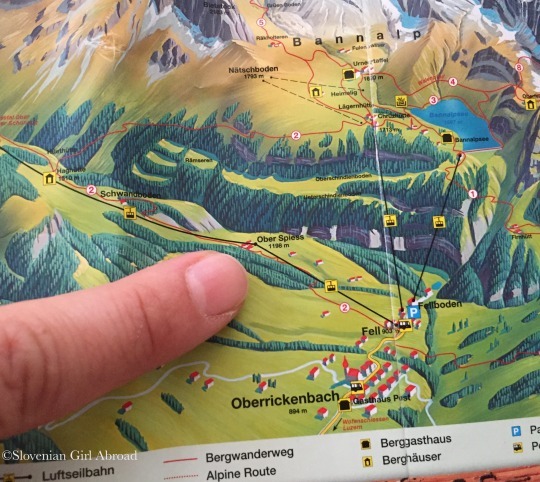 Hi Ariana, we drove to Oberrickenbach by car, but we’ve started our hike close to the cable car station. Bus stop was just next to it, but unfortunately I don’t remember how exactly it is called. My guess would be Talstation or something similar. Switzerland is full of surprises! I did not know about this place, how absolutely beautiful it is. I wonder how they created this artificial lake? Just curious, it adds the perfect touch to the scenery. It is full of surprises, right? 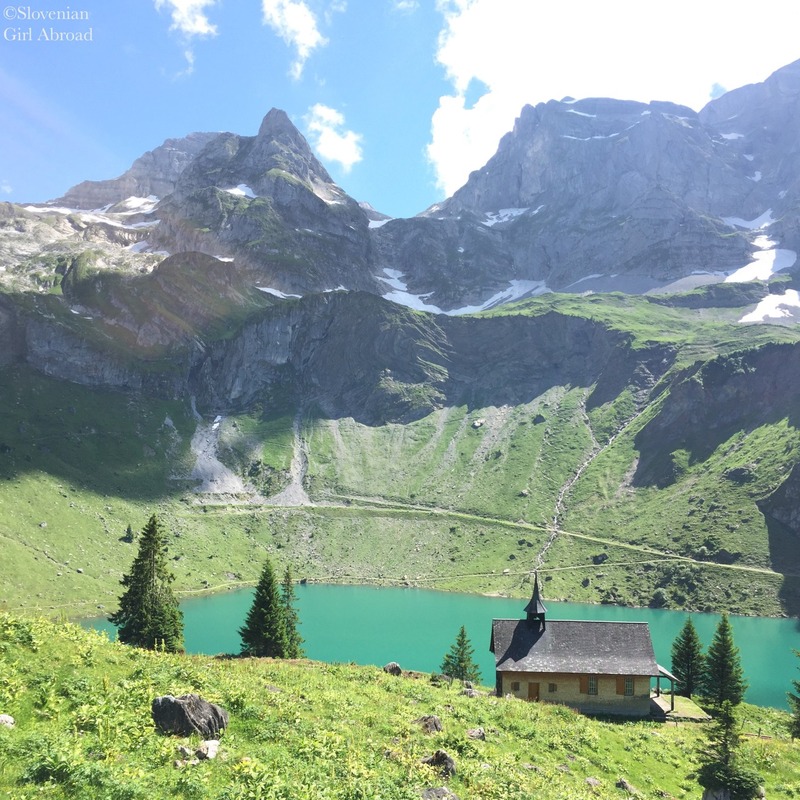 🙂 Wikipedia says Bannalp Lake was created in 1930s by building a dam during the construction of the power plant in Oberrickenbach. Wow, this looks absolutely stunning. We’ve only ever been to Geneva so definitely have to go and see more of Switzerland. Great photos!